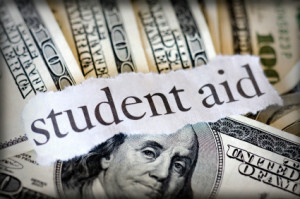 Home › FAQ › What are the Different Types of Financial Aid? If you’re planning on attending college, aren’t independently wealthy and don’t have anyone who is willing to pay for your education, you should probably start looking at the different types of financial aid. Grants, scholarships and loans are all great resources and are available to most college students. Grants are normally need-based. Out of all of the different types of financial aid, they’re probably the most common for low-income individuals. Unless you’re an independent student, your grants will be determined by your parents’ incomes and assets and your own financial situation. To find out whether you’ll be considered a dependent or independent student, you can visit the Office of Federal Student Aid’s website. Need is calculated by using many different factors, so you should apply for grants no matter how much your family makes. Grants can come from different sources, including the federal government, your individual state, and your college or university. For instance, the Federal Pell Grant is a federal grant that may award you over $5,000 each year if you come from a low-income background. Grants are considered gift aid. This means that they never have to be repaid. Scholarships also never have to be repaid, but they’re usually merit-based. Out of all of the different types of financial aid, scholarships are more geared to high-achieving students. You may qualify for one or more scholarships if you received good grades in high school and did well on the SAT or ACT. There are two types of scholarships: competitive and automatic. Competitive scholarships are only given to the most well-qualified applicants. To get these, you may need to do more than get good grades or test scores. For instance, you’ll have a better chance of getting a competitive scholarship if you did something particularly note-worthy in high school, played varsity sports or held a leadership position in one or more clubs. Automatic scholarships, on the other hand, are given to all students that meet certain criteria and submit their application before the deadline. Most automatic scholarships are given out by individual colleges and universities. Like grants, scholarships don’t have to be repaid, but you may need to keep a certain grade point average to continue to qualify for them throughout your college career. Different types of financial aid have different terms. For instance, grants and scholarships don’t require repayment, but loans do. Most students don’t get enough grant and scholarship money to totally cover the cost of their education. This is where loans come in. Federal loans are usually the best loans because they have low interest rates, are available to almost all students regardless of credit history and have many repayment options. If you still don’t have enough money for school after you’ve taken out the maximum amount of federal loans that are available to you, you might need to start looking at private loans. While these usually aren’t as favorable to students as federal student loans, they’re still a good way to pay for your education. College can be expensive, but that doesn’t mean that it’s beyond your reach. There are many different types of financial aid, and you should be able to afford college if you use all of the resources that are available to you.